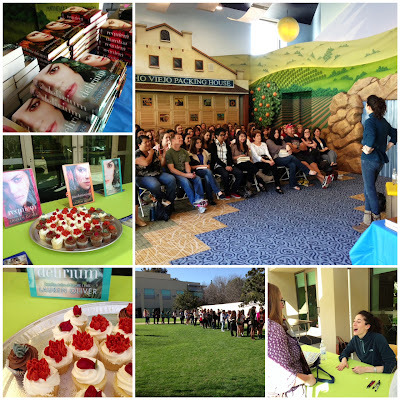 Lauren Oliver, author of the spellbinding dystopian Delirium series, visited the Mission Viejo Library last month, and we were thrilled to snag an interview with this amazing author! Michelle is still on semi-maternity leave with her cute baby, so I was joined by our good friend Lalitha of Masala Reader for this event. Want to download this podcast? Click here for an mp3 or find us on iTunes. Lauren's visit to the Mission Viejo Library was fantastic-- her fans were rapt as she spoke about her writing and read an excerpt from Requiem, the final volume of her New York Times bestselling Delirium trilogy, and everyone enjoyed mini cupcakes iced to match the covers of Lauren's books as they waited in line to meet her and have their books signed. Visit Lauren Oliver's website to keep up with her upcoming titles, and be sure to take a look at her publisher, HarperCollins. In the Southern California area? Visit the Mission Viejo Library and keep a lookout for any upcoming author visits. Podcast hosting courtesy of archive.org. Intro music by 46bliss. Special thanks to our sound engineer, Marc Conrad Tabula, for his awesome audio editing skills. Please subscribe to Authors are ROCKSTARS! on iTunes so you'll never miss an episode, and thank you for listening! Got a question for Leigh Bardugo?